On Sunday TV program «Alo Presidente!» Hugo Chavez again raised the subject of Russia, conflict at the Caucasus and the role of the USA. Speaking about the importance for Venezuela to strengthen the system of national security, the Venezuelan president has pointed out that this process will continue with assistance from the Russian Federation, main «strategic ally» of Venezuela. Chavez reminded that the Venezuelan army already has Russian aircraft and new ones are going to be added. He's also said that Moscow will soon supply the air defence system to Venezuela with missile range up to 200 km. «We are not going to shoot at anyone, but nobody should be mistaken about us», - stressed the president. 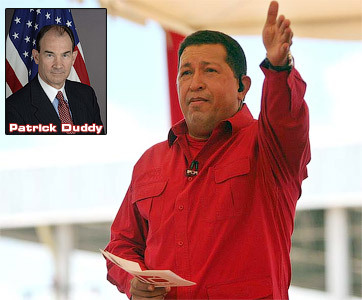 «We've been waiting for more than three years to buy from Brasil spare parts for our aircraft, but the United States have forbidden the transnational company to deal with us», - continued Chavez. According to him, the United States want to depict Moscow as an aggressor in the Caucasus, though actions of Russia were very legal and Venezuela would have acted the same way under such circumstances. The United States «surround Russia, but it has risen and again spoke about itself as a superpower, giving a clear notice that hegemony of yankees came to an end!», - declared president of Venezuela. Once again Chavez told the United States that his country would not tolerate disrespectful attitude towards itself. This time he meant accusations from the American ambassador Patrick Duddy that Caracas is poorly fighting drug business and therefore the traffic of Colombian heroin has considerably increased through the territory of Venezuela. In response the president of Venezuela stated, that according to international organisations his country is among the leaders who most successfully fights drug trafficking. On the contrary, the United States are the largest in the world producer of marijuana. According to University of Mississippi, whose data was quoted by Chavez, every year the USA they produce corn for 23 billion dollars whereas marijuana is produced for 35 billion. But on the territory of Venezuela there are no marijuana or poppy seed plantations at all! That is why the USA have no moral right to accuse anyone at all! Standing at the map Chavez charted the routs, along which the drugs are transported from Colombia to the United States (bypassing the air space of Venezuela) and put a question: why the United States, having their military bases and aircraft in Colombia, do not prevent these flights. Are they unable or unwilling? Chavez warned that his country would not tolerate interference in their home affairs. If the ambassador of the USA continues to violate international norms in the future, he will have to leave Venezuela. «You can either pack your suitcases and get out of Venezuela, or select the words in a better way», - said Chavez to the American ambassador.